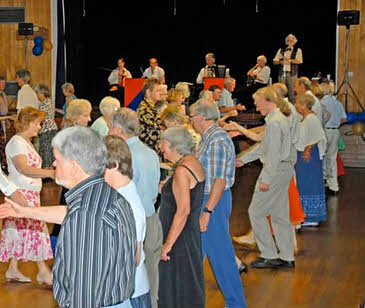 The Fine Companions folk dance club of Beford, England, UK celebrated their 75th anniversary in 2010. I was asked to call for the Anniversary dance held on 16 July 2010, and I wrote this dance for the occasion. Roger Nicholls, who was the leader of the Orange & Blue band and a long-standing member of Fine Companions, composed music for the dance. The dance aims to combine old and new. The first half is in 18th century style, while the second half contains more modern figures. Longways duple minor proper (double progression). It is not a good idea to have a 'spare' couple at the bottom when the sets are made up. Even if the couple there during the walk through manage, it will confuse subsequent couples who progress to the bottom of the set. The dance "Companions at 75"
A 48 bar tune (AABCCD) for the dance was composed by Roger Nicholls. The following two tracks give 5x48 bars, and then 2x48 bars. The latter is suitable for "a few more turns", a convention which seems to have gone out of fashion lately. I had hoped one day to get a recording of Roger Nicholls' band, the Orange and Blue, playing this tune, but unfortunately it never happened. So here is a recording of Roger playing it solo on the accordion. A score is available online. 5‑8 two-hand turn partner once round. 7‑8 second corners change places. 5‑8 2nd couple ½ figure of 8 down through 1st couple. C1 1‑8 Balance (R,L,R,L) and swing new neighbour to change places. Couples at top and bottom of set balance & swing partner to finish proper, then stand out C2 & D 5‑8. C2 1‑8 Ladies chain across and back. 5‑8 1st couple ½ figure of 8 up through the 2nd couple who are currently immediately above them to (double) progressed places - all are proper.